Québec City is simply beautiful in the summer and fall. Old Québec’s historic architecture looks stunning nestled among all the flowers and multicolored trees. But visiting Québec City in the summer comes at a price—visitors have to share the streets, restaurants, and attractions with a lot of other people. So why not avoid all the hustle and bustle and visit in the off season? If you’re on the fence, let me tell you why planning a group trip to Québec City between November and May is great idea. We all know that accommodation pricing obeys the law of supply and demand. 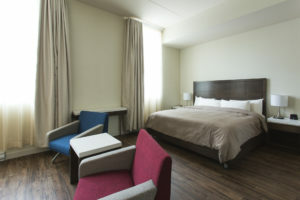 In 2018, the average rate for a hotel room in Québec City was $197/night in July and August and only $126/night in March and April—that’s a 56% difference! And the difference was even greater (61%) for hotels with over 200 rooms. On average, visitors to the Québec City area spend 37% of their travel budget on accommodations, so it’s easy to understand that when you save more on the rooms, there’s more money available to offer your clients better restaurants, more unusual entertainment, and more popular activities. What better way to stand out from the competition! And you could save even more by contacting service providers that are also looking to offer their activities for a longer period of the year to make their facilities more profitable and retain skilled employees. Certain suppliers are more willing and able to handle custom requests during the off season. The staff in Québec City’s stores are known for being extremely welcoming and generous with their time, and these qualities shine even brighter during less busy periods. In November, when the trees shed their leaves, the days get shorter and shorter, and the temperature inches closer to 0oC, the atmosphere of the city completely changes. The shopping streets in each district trade their jack-o’-lanterns for lights and it begins to look a lot like Christmas. Fir trees of all sizes appear throughout the city, brightly adorned with lights and colorful decorations. Store windows glisten with lively displays as the evenings grow longer. All the bars, cafes, and restaurants take on a warm and cozy feel—time seems to expand and people linger over shared mealso or enjoy drinks by the fire. With a bit of luck, your clients may witness the first snow of the season—it doesn’t stay long, but it never fails to delight children and the young at heart. 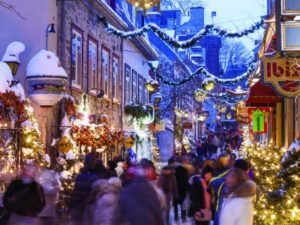 When you visit Québec City in December, January, and February, you can get to know Quebecers and better understand their relationship to winter. Want to offer your clients from outside Québec an unforgettable trip? Why not introduce them to a real Québec winter! Québec City has everything they need to have a blast and venture off the beaten track, while still enjoying the comfort of a four-star hotel in the heart of the city. 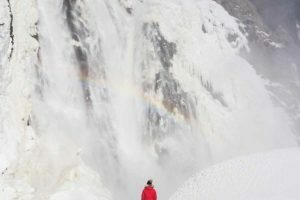 Whether your groups are more interested in culture or the great outdoors, you can guarantee they’ll have an unforgettable experience with winter classics like the festive atmosphere of the Petit Champlain district, the spectacular falls at Parc de la Chute-Montmorency, or the majestic Hôtel de glace, which is sure to wow them. 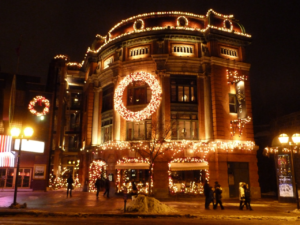 You can also experience the joys of winter without ever leaving the city! Your clients will have plenty of stories to tell when they get back from ice fishing inside a comfy igloo on Bassin Louise or exploring the Plains of Abraham, guided by an early 20th century snowshoer (traditional snowshoes, arrow sashes, lanterns, and hot chocolate are included). There’s also no shortage of activities for more athletically-inclined visitors looking to take full advantage of a snowy destination. 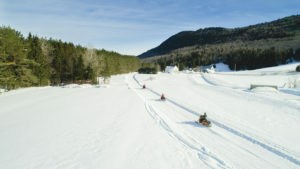 Why not give snowmobiling a try? Or take the opportunity to safely learn how to ski or snowboard? Or even experience the thrill of driving a team of sled dogs? And the best part is you can do it all without travelling too far out of town! 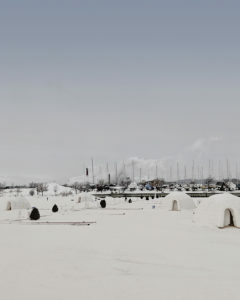 In March and April, it starts to warm up and the snow begins to melt, making it nicer to explore the city on foot. Visitors can take a personalized guided tour of Old Québec and surrounding areas such as the St-Jean-Baptiste and Montcalm districtst. 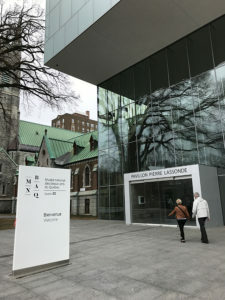 It’s so lovely to stroll by Québec City’s historic sites, walk along rue St-Jean and up rue Cartier, stop for a warm drink at a café or visit Musée national des beaux-arts du Québec, then continue along Grande-Allée before heading back to enjoy a glass of wine or relax at the hotel’s spa! 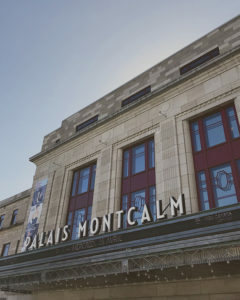 In the evening, it only takes a few minutes to walk to Place d’Youville, where your clients can enjoy dinner and a show at Théâtre Le Capitole or an intimate concert at Palais Montcalm. In early spring, your clients may be in the mood to shop till they drop! There are lots of stores and shops in the downtown area, but Québec City also has a number of major shopping centers and each has its own vibe. The two main ones are Laurier Québec, which is the second largest shopping center in Québec with over 12 million visitors each year, and Galeries de la Capitale, which was recently renovated and includes a Cineplex IMAX movie theatre and an amusement park. Both centers offer significant benefits and discounts to tour groups—simply contact their customer service before you visit. 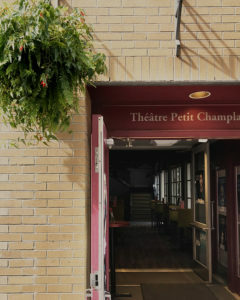 Québec City has the advantage of being located near amazing farmlands—such as on Île d’Orléans and in the Portneuf region—that are put to creative use by talented producers. 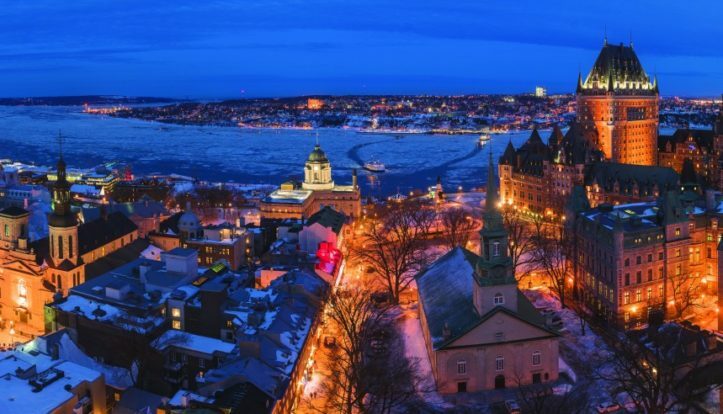 What with its tradition of European cuisine with a North American spin, Québec City is a great place to live and an even better place to eat. Early spring, when the world is coming out of its winter slumber, can be a great time for your clients to take a group cooking class and learn about local products and regional culinary traditions. Bon appétit! It’s just as possible to plan an exquisite trip to Québec City in November as it is in July or September. No matter what the season, Québec City’s fortifications and historic buildings stand tall against the sky, brimming with European charm. But the atmosphere changes with the seasons and each month has its own unique feel. Every season offers visitors an authentic one-of-a-kind experience. The off-season is the best time to fully experience the friendliness that Quebecers are known for. 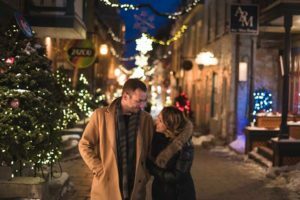 The cozy winter atmosphere and the slower pace—especially outside the Winter Carnival period—leave more room for genuine encounters and discussions with locals that your clients will really appreciate. If you need help developing a new tour program for a trip between November and May, please feel free to contact me. I and the advisors at Québec City Tourism would be happy to assist you in planning a special and unforgettable stay for your clients. I would like to share an amazing experience I had recently at the show, Piano Man Experience. I went with my coworker Maxime, group artists coordinator, and we didn’t really know what to expect. It was an incredible evening! Christian Marc Gendron is an accomplished pianist who recreates the experience of a piano bar by performing timeless hits by the great singers and composers from the 1940s to today. Gendron masterfully hosts the evening, which includes a medley of greatest hits by Ray Charles, Billy Joel, and Elton John to introduce people to the repertoire and a quiz to encourage audience participation. The vocals by talented singer Manon Séguin gave me goosebumps. Supported by three other musicians, her powerful voice and touching interpretations of the songs moved everyone in the audience, both young and old. It was a magical evening! On behalf of the staff at Hôtel Château Laurier Québec, I’d like to wish you all health, happiness and success for the New Year and I hope you discover your own favorites during your next stay in Québec City. Don’t forget to tell your group leaders to come and see me when they arrive at the hotel—I have a gift for them!